Many African Americans can relate to the years of frustration Paul Mosley had trying to track back his family history. For Paul, there was always a certain point where the trail ended. Like many African Americans, Paul’s search came up empty. The U.S.’s history of slavery severed his connections to the past. Instead of being able to find ancestors’ names in old birth and death records, or Census records, many African Americans must resort to combing through slaveholder property records, or slave auction logs. Even rarer, are those records or even oral histories to give people like Paul a way to trace their family ties back to Africa. “I became angry every time I would see someone saying their family tree traced back to Ireland, Italy or some other country, and I couldn’t find my family because of slavery,” he said. Using paper records, Paul had been able to trace his ancestry to about 1870, but he couldn’t go back any further. So after he received 23andMe as a gift, he eagerly awaited for what he might learn through DNA. While he knows his ancestors were forcibly brought here from Africa because of slavery, he’s always wanted to know more about his family’s origins. That first step in learning more came when he opened up his 23andMe Ancestry Composition report. “I logged in, and the tears started to well up in my eyes because my results showed that almost 90 percent of my ancestors traced to West Africa and the shores of the Transatlantic Slave Trade,” Paul said. 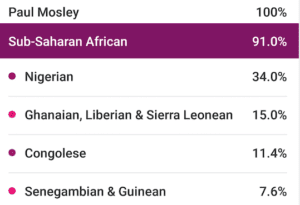 His results showed that he was 91 percent Sub-Saharan African, and his DNA connected him to 15 populations in West Africa – with the largest percentages coming from Nigeria, Ghana, Liberia, Sierra Leone, and the Democratic Republic of Congo. The emotional reaction surprised him, he said. He hadn’t expected the profound impact it had on him.